What Are the Key Takeaways That the Audience Will Learn From Phoenix Rockstar Speaker Marvelless Mark? 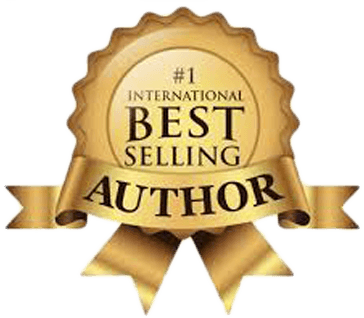 BE THE ROCKSTAR & INVITE MARVELLESS MARK® TO SPEAK AT YOUR NEXT PHOENIX EVENT! Take corporate entertainment and team building to the next level for your company. so that they can become business rock stars & take your company to new heights. For your next corporate event or conference, hire the right Phoenix motivational speaker and team building expert, and motivate your employees to start performing like a legendary rock band instead of individual soloists. 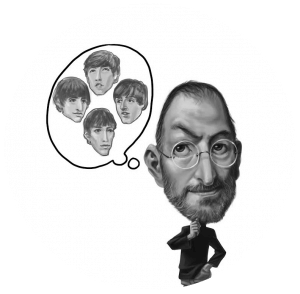 With the right business expert, you’ll have someone who is capable of uncovering your employees’ inner rock stars and inspiring them to achieve their goals. Wouldn’t it be amazing if your employees were excited to come to work, work together, and produce the best results possible? You don’t have to settle for lackluster enthusiasm and a “me first” attitude in your organization. You don’t have to accept the less-than-impressive productivity or any negative mindsets currently at play. 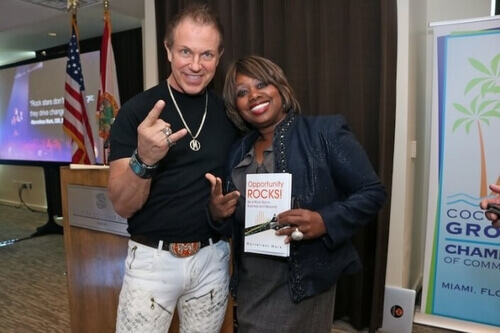 You need the perfect motivational speaker to get them excited and ready to rock. Phoenix motivational speaker Marvelless Mark Kamp will show your team what it means to work towards a common goal, supporting and assisting one another along the way. He’ll help them adopt a positive mindset, get excited for “we” rather than “me”, and keep your employees solution and forward-focused so that you have a happier work environment. With happier employees, morale improves, productivity improves, and your bottom line improves. Marvelless Mark understands that things aren’t necessarily as they appear. He’ll reach out to a few of your key employees before the presentation to understand the dynamic at play and uncover any issues that you might not even be aware of. You’ll not only have a better understanding of how your employees interact and how you can improve their relationships in the workplace, but you’ll also have the opportunity to identify problems and make changes before the situation gets serious. A Phoenix team building speaker can educate and inspire your employees to work together towards a common goal. They will no longer be focused on what’s best for the individual, but what’s best for the company as a whole. 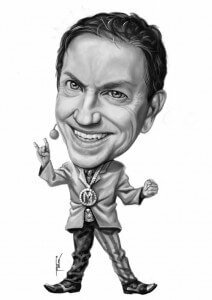 Marvelless Mark has entertained and motivated Phoenix audiences for years. Yum Restaurants, and many others. He taught them how to be business rock stars and he can do the same for your team. 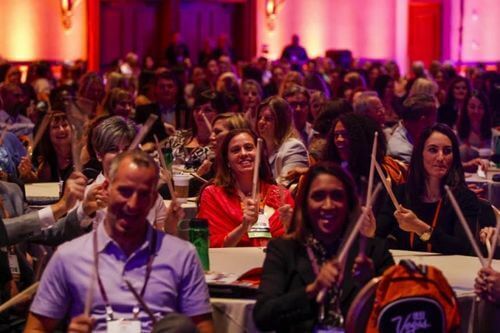 Help your team become the business rock stars you know they’re capable of with keynotes, breakout sessions, or training from Marvelless Mark. 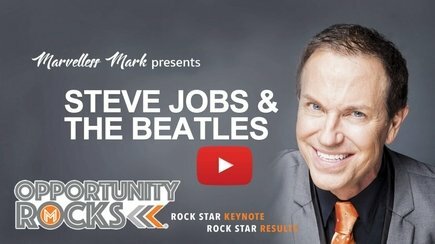 Named after his signature book, the “Opportunity Rocks” keynote will have your team headbanging all the way back to the office. 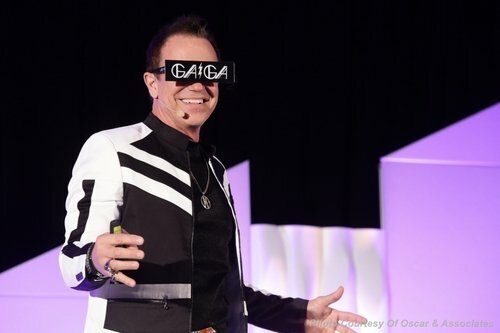 By studying the lessons of their favorite musicians, they’ll learn the business content they need to flourish in a business environment, This keynote is interactive and fun using high- energy presentation and the music that gets them rockin’ to inspire Vision, Action, and Change. 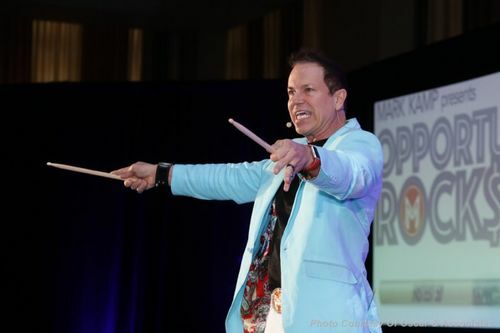 From the moment your attendees step into his keynote, Mark’s energy and enthusiasm will wow your audience. The excitement is palpable as he encourages every individual to Dream bigger, Drive Change and most importantly, take Action. 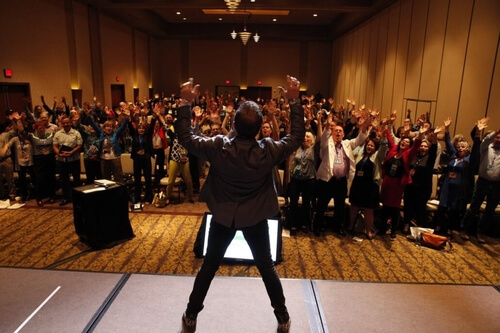 With Marvelless Mark’s® special Rhythms in Business® finale, your attendees will jump to their feet, ready to rock out, take action & transform their business. Can you picture your team pretending they’re John Bonham from Led Zeppelin or Keith Moon from The Who? You’ll not only get to see this in action, but you’ll also watch as your team takes that energy back to work with them. BRING MARVELLESS MARK TO YOUR EVENT, CLICK HERE TO BOOK YOUR PHOENIX EVENT TODAY! Marvelless Mark Kamp is an energetic, entertaining, motivational keynote speaker that will wow your audience and leave them forever changed. Mark’s approaches corporate entertainment with the same enthusiasm he brought to his show on the Las Vegas Strip. His keynote invites audience participation and creates energy (like you’d expect at a rock concert) throughout his entire presentation. Mark will build rapport with your audience and set the perfect tone and pace for your event. 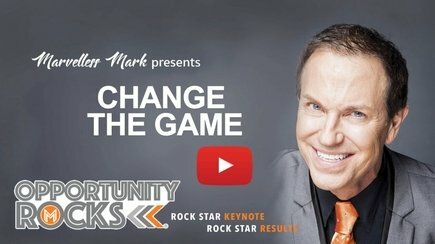 If you’re looking to rally the troops, strengthen your team, and improve your business, Mark’s keynote is exactly what you need. 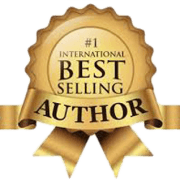 Marvelless Mark is a Phoenix motivational speaker, team building speaker and meeting ice breaker, and emcee who will have your meeting bursting with energy, interaction, and fun. All while delivering a powerful business message to your audience. There are few keynote speakers that have the experience and energy of Mark Kamp (aka Marvelless Mark). He not only brings business experience from the travel industry, retail, and sales (where he maintained top executive sales status) to your event, but he’s also spent a good part of his life entertaining audiences as a radio host, an emcee, and a Las Vegas headliner! 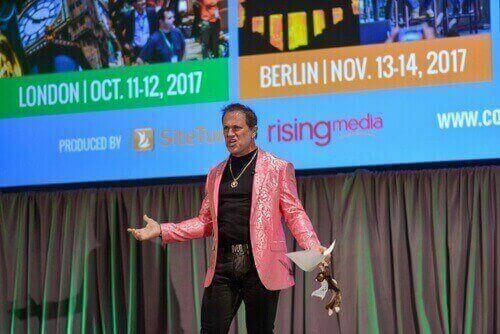 Mark’s passion for performance (both on stage and off) are obvious in every business presentation he gives. He brings the right mix of motivation, engagement, and audience interaction to his sales training presentations and has earned global recognition for his contributions since starting in 1988. Always looking to grow in business, he’s been educated through Chris Lytle’s sales programs, Ken Greenwood’s sales training, and Ronald L. Voss’ sales courses. He’s expanded his mind by mastering Steven Covey’s and Dale Carnegie’s professional development courses and has attended Napoleon Hill’s Think & Grow Rich programs, taken salesmanship courses at Southeast Missouri State University. and graduated from Anthony Robbins’ Mastery University. Passionate about staying healthy for himself, his wife, his adopted step-daughters and two corgis, he eats clean, works out regularly, and devotes plenty of time to the family and his faith. He is also an active member of Verve Church in Las Vegas. Opportunity Rocks is the perfect way to start or close any conference. Give them the emotional and inspirational boost they need to release the past and get the most out of your event. A motivational speaker like no other, Marvelless Mark is the perfect choice for your next Phoenix event. BRING MARVELLESS MARK TO YOUR PHOENIX EVENT, CLICK HERE TO BOOK TODAY!